The MidSouth NAMA Chapter is proud to serve as an advocate for the agriculture industry to the larger MidSouth population. Many in the urban world have forgotten the fundamental connection to agriculture. Insulated by the apparent abundance of food that has come from new technologies for the growing, transportation and storage of food, people's fundamental dependence on agriculture is often overlooked. Farmers in America today are a minority group that represents only about 1.5 percent of the US population. Meanwhile, the majority of Americans are three or four generations removed from a farm, and many haven’t even visited a farm in five years or more. That means the average American lacks understanding about the important role agriculture plays in all our lives, and it’s up to those of us in the industry to speak out and answer consumer questions. Want more information about agriculture-related issues? Here are a couple of associations we trust that are doing great work to promote agriculture with truth and transparency. The AgChat Foundation is designed to help those who produce food, fuel, fiber and feed tell agriculture’s story from their point of view. The Foundation is built from the highly visible “#AgChat” community on Twitter. This weekly moderated chat has served as an international meeting place where the people of agriculture can discuss difficult issues, tell their farm stories and identify ways to connect with people outside of agriculture. 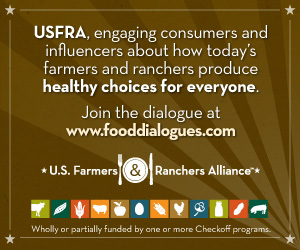 US Farmers & Ranchers Alliance (USFRA) consists of more than 80 farmer – and rancher-led organizations and agricultural partners representing virtually all aspects of agriculture, working to engage in dialogue with consumers who have questions about how today’s food is grown and raised. USFRA is committed to continuous improvement and supporting U.S. farmers and ranchers efforts to increase confidence and trust in today’s agriculture. The Food Dialogues signature events are designed to bring together farmers, ranchers, industry experts, pundits, media and consumers for dynamic panel discussions on some of today’s most pressing topics related to food and food production. Since its launch in 2011, the U.S. Farmers & Ranchers Alliance has hosted five major events, including 14 panels across the country that streamed live online.